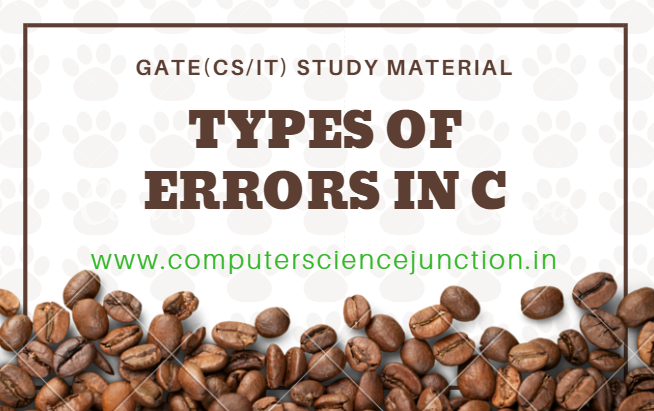 In this technical article different types of errors in c programming are explained. This article also covers the difference between syntax errors and semantic errors, difference between logical errors and run time errors and difference between compiler and interpreter is also explained in this article. What are different types of errors in c ? Difference between syntax error and semantic error. How logical errors are different from run time errors?. difference between compiler and interpreter is also explained in this article. Syntactic errors additionally called compilation errors and caused by violate the grammar rules of the programming language. The compiler detects, isolate these errors and provides terminate the computer program when listing the errors. • missing return type for a procedure. • missing or duplicate variable declaration. Semantic errors are logical errors. If there's a run time error in an exceedingly program, it'll run with success, in the sense that the computer will not generate any error messages, but it will no do the right thing. The problem is that the means of the program is wrong. Here the term meaning of the program represents the semantics of the program. Identifying linguistics or semantic errors are often tough as a result of it needs working by observing the output of the program and attempting to work out what it's doing. Run-time errors: Errors like data type mismatch or array out of bounds error are called run time errors. These errors are typically go unobserved by the compiler thus programs with error can run however turn out incorrect results. Logical errors: These are the errors which are connected with the logic of the program execution. These errors aren't detected by the compiler and these occurs due to to a poor understanding of the program or an absence of clarity of hierarchy of operators.Such errors cause incorrect result. These are the types of the language translators. If the program is error free, computer program is formed and loaded into memory for execution. A compiler produces a mistake list of the program in one go and every one need to be taken care even before the execution of initial statement begin. It takes less time for execution. An interpreter is additionally a language translator that interprets and executes statements within the program one by one. It works on one statement at a time and if error free, executes the instruction before getting to second instruction. Debugging is easier in interpreter because it is finished bit by bit. An interpreter takes longer for execution of a program as compared to a compiler. I hope that this article will be helpful for student to understand the concepts of different types of errors in c programming and the differences between syntax and semantic errors, logical errors and run time errors and compiler and interpreter. What is process control block ?